“Tommy, you're going to go visit your grandma Naomi for a week. You'll have such fun. She lives in the big city. You can go shopping and see lots of cars and interesting people.” Mrs. Harmon smiled at her son. They saw cars of every color and size and all sorts of shops and restaurants. When they pulled up in front of Grandma Naomi's apartment building, she stood waiting for them. “Tommy! I'm so happy that you are coming to visit me.” She hugged him and took his suitcase. “Yes, of course. 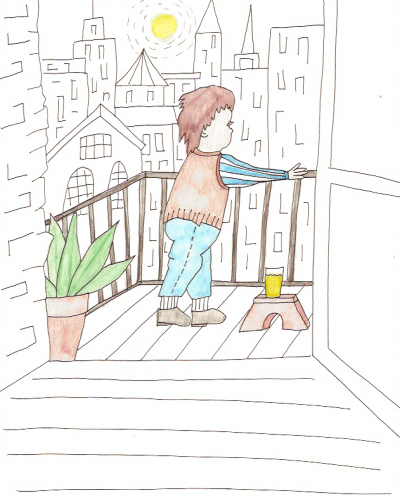 Why don't you take a glass of lemonade and you can look out at the city.” She handed him a tall, frosty glass of icy juice. Tommy stood at the railing. He could barely see the sun because the buildings blocked his view. The pigeons flew down when they saw him nibbling on a cookie. He crumbled it up and held out his hands. The pigeons landed on his arm and ate the pieces. Tommy laughed. Grandma Naomi took him to the zoo, to toy store, a fancy restaurant where he had to wear a tie, and for a ride up to the top of the tallest building. Each night when they went back to her apartment, he stood outside and fed the pigeons. The week went by and soon it was time for his mother to pick him up. He packed his suitcase and went into the living room. “Grandma, thank you for letting me come. I had fun. I'll remember this for as long as I live.” He ran into her arms and hugged her tight. When his mom pulled up, he climbed in the car.